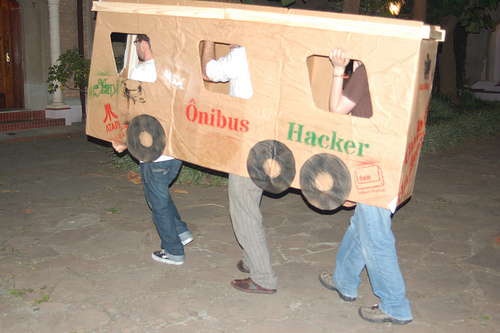 The Hacker Bus project was born from the Brazilian online community Transparência Hacker, ‘Hacker Transparency’. It was created in 2009 around a HackDay in São Paulo, and the group’s discussion list now counts over 700 members. As its name says, its focus is (h)activism in favor of public transparency and open data. Previous and ongoing projects include Otoridades, a portal where Brazilians can denunciate abuses of power, and Mapas Livres, which focuses on open mapping. According to Pedro Belasco, a software developer who’s been part of the group since the very beginning, the Hacker Bus project germinated quite a while ago. The idea was that by bringing people together physically, the group’s lobbying would be more efficient. When he heard that a band was selling its tour bus, he realized it would be great for Hacker Transparency to have its own. With a bus, they would be able to publicize their cause and run local projects, even in remote areas of the country. He shared his idea with the rest of the group, who decided to try and raise money for this project. They estimated they needed $26,000 to buy an old bus and refurbish it. Luckily, their need for funds coincided with the emergence of crowdfunding in Brazil. In fact, several local platforms have been launched in 2011. They chose Catarse, which launched just 6 months ago. Although a few projects had already been successfully funded via the platform, it was the first time someone was trying to raise so much money. It meant that the group had to create a powerful campaign so they created a promotional video and even organized a flashmob in Sao Paulo. Still, they couldn’t help being surprised by their own success: they managed to raise 146% of their original goal, most of it from people they didn’t know personally. Although Hacker Transparency is thrilled, the group is also slightly overwhelmed by practicalities: Will they have to create a formal legal structure? According to Pedro, having a hierarchy wouldn’t make sense for a group whose members come from very different horizons. However, they might still have to consider it to benefit from interesting opportunities. For example, local authorities sometimes grant buses the police seized from traffickers to universities and other institutions. If Hacker Bus didn’t have to pay for the bus itself, it would liberate resources for their activities. For now, the team is working on defining their schedule. Their goal is to have everything ready by December, on time to participate in Rio de Janeiro’s Digital Culture Festival. Sao Paulo’s Campus Party is also on the agenda, as well as ConSocial. This government initiative will be Brazil’s first National Conference on Transparency and Social Control. The debate will start with regional meetings in many Brazilian cities, and it’s hoped that Hacker Bus will attend at least some of them – according to Pedro, the group tries to participate as much as possible in public consultations. Of course, the most important part of the project will be its interaction with the general public. Hacker Transparency calls it ‘Hacker Invasions’: the group’s plan is to visit small towns, where they can have a stronger impact on local realities. It doesn’t mean they will come up with ready-made solutions; it will be a work in progress, in partnership with the local population. During one weekend, they will listen to the inhabitants’ needs and help them develop answers thanks to technology, from blogs to apps. In other terms, it will be a local version of their HackDays, which will also raise awareness for open data and the overall hacker culture. Although these actions are local, Hacker Bus hopes to have a larger impact: thanks to webcams and 3G, anyone interested should be able to watch their progress in real time. 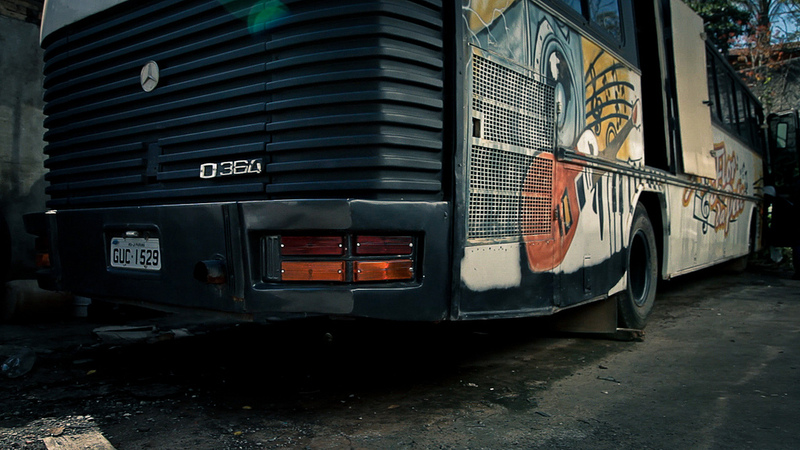 Hacker Bus might even physically go beyond Brazil’s borders as the group has received an invitation to visit Uruguay. Quite impressive for a project which only started fundraising less than two months ago. What do you think of this project? Would a Hacker Bus be welcome in your city?